We are engaged in Manufacturing & Exporting of Instrument Box, we manufactured by them with the high quality rawmaterial & this highly demanded by the large organisations. Set of 17 instruments Export Quality Standard make. 600D Bottle Green Nylon Bag. Soft cushion velvet inside does not harm or spoils your instrument. Provided inside with a velvet pocket 160 x 120MM to store accessories. Nylon Hinging Belt with gold anodized hooks and accessories. Full length zipper. Size 330 x 260 x 100MM. Size as per customer's requirement. So as to meet with the growing desires of our patrons, we are presenting to our patrons an inclusive compilation of Bench Top Instrument With Different Cases. These products are extensively praised and acclaimed due to their fine finish and durability. Not only this, their impeccable designs makes these highly commended and valued. 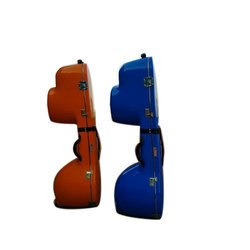 We have marked a remarkable position in the market by offering the best quality array of Musical Instrument Anvil Box.